← Just another French president ….. Happy Birthday to the USMC, the United States Marine Corps Or (Uncle Sam’s Misguided Children – Leather Necks and Devil Dogs and some other unmentionables) as we are fondly refereed to. 234 years ago, a group of bad assed civilians got together at the Tun Tavern In Philadelphia and organized the Continental Marines, that eventually ended up being the United States Marine Corps. Tun Tavern, “birth place” of the Marine Corps. 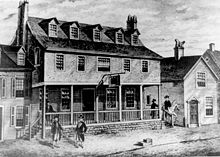 Tun Tavern, in Philadelphia, Pennsylvania, is regarded as the birthplace of the Corps as the location of the first Marines to enlist under Commandant Samuel Nicholas, though it is disputed if a recruiting drive may have occurred earlier at Nicholas’s family tavern, the Conestoga Waggon [sic]. When the Revolutionary War ended in 1783, the Continental Navy was disestablished, and with it, the Continental Marines. The Corps was re-established on 11 July 1798, when the “act for establishing and organizing a Marine Corps” was signed by President John Adams. Through the years, the Marine Corps has stood out among others as one of the finest military organizations around the world, one of the most effective, heroic and dedicated branches of the of the military. It is a brother-hood like no other. Race, religion, color of skin, how their daddy is never made a difference 234 years ago and still does not today. I still would like to include the Army, Navy, Air Force and the Coast Guard for their loyal, unselfish, dedication and contribution to keeping America safe. ALL the people in the military, regardless of what branch, are one of the primary reasons the citizens of the USA and many other countries in the world have the freedom we enjoy. Turn up your volume. After 60 years I still get goose bumps. From the Editor and Chief of the Goomba Gazette – HAPPY BIRTHDAY and many more!! Good luck – best wishes for a speedy recovery to of my dear Marine Corps friends – J M & M P . They are the best of the best!! This entry was posted in amazing people, freedom, military, Opinion and tagged THE WORLD'S FINEST. Bookmark the permalink.